When someone from Paramount Pictures wants a pair of brand new vintage Converse shoes and they absolutely have to get to Hollywood by tomorrow morning so they can be used on the Netflix sitcom Grace and Frankie, you get the damn shoes to Hollywood by tomorrow morning. I remember those, with the messed up line alignment. And I'd welcome them back in a heartbeat. Who's gonna be wearing them? I don’t know, but I briefly talked to her on the phone and then texted. The show stars Jane Fonda and Lily Tomlin, so they *could* be options. Hope you soaked them for a lot of coin on those… and perhaps a small role in the next Star Trek film. How many pairs do you currently have? BTW that is pretty cool that some network calls you for shoes!! didn't you sell some stuff to Hollywood in the past? Pretty wild. In 2000, my Bose 901 VI's were sold to the Hershey factory for their break room. True story. Negative. I sold my previous two pair of deadstock Converse from the 50s and 60s to two buyers overseas (Thailand, I believe). They're huge sneakerheads over there, especially for vintage Converse. 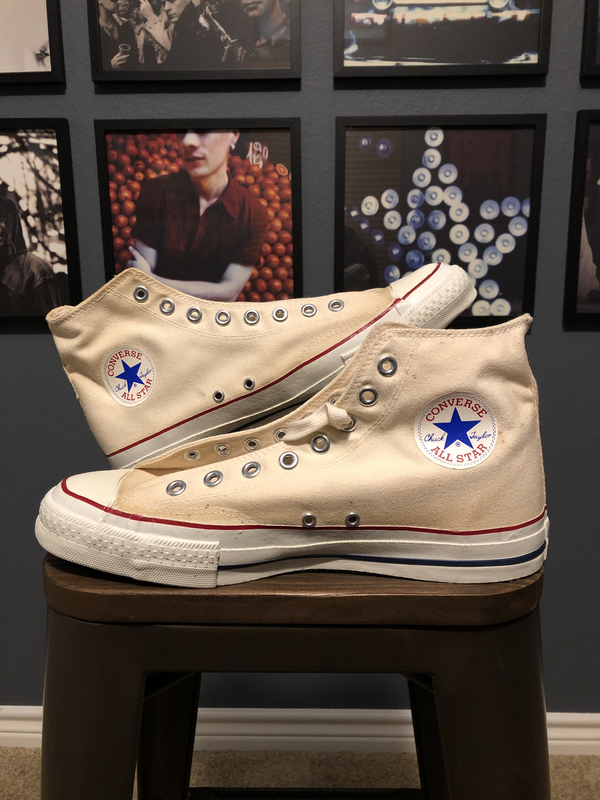 This was the last of the Converse that I have in stock, though I'm in talks with someone to buy a couple more pairs similar to these. I have two pair of Nikes and a pair of Etonics remaining, as well as dozens of pairs of vintage tube socks from the 70s and 80s. Check out my other thread on the vintage haul I made. The Nike LDVs are first editions from the 1970s and in immaculate condition. They are valued quite high, so I'll be excited when they move. I got $200 plus shipping for them. The only role I'd be qualified in playing is that of a ghoulish-looking alien. I had a buddy who sold a Triumph TR-7 IIRC for a movie just so they could promptly wreck it in some stunt. Since it was on eBay, the price was already set; otherwise, I would have asked for a bit more!